Nespresso Expert offers a versatile level of settings with four coffee cup sizes including a Nespresso Americano for a longer mild coffee experience and the choice between three temperatures. The machine offers a distinctive design with a cutting edge flat-to-the wall shape inspired by the world of barista with brushed aluminium finish. 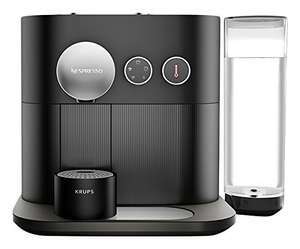 Thanks to Bluetooth smart technology, Nespresso Expert enables you to create your own customised coffees, smartly gives you access to an easy ordering of Nespresso capsules and a simplified machine care and assistance.Note:Try Nespresso pods and check the machine has not been damaged try to descale ( a function without pods being required). Purchase a qualifying Nespresso Original coffee machine from Amazon.co.uk between 24th October 2018 and 31st January 2019 and claim your free complimentary 150 original capsules and travel mug (RRP £18), subject to a minimum purchase of 100 Nespresso Original Capsules in a single transaction, until 31st March 2019. Capsules are an expensive way to make coffee though, better just to get a simple filter machines and fresh filter coffee in my opinion. A complete waste of money buying this machine as the coffee strength is dictated by the pods. Putting more water through a pod designed to make an espresso will just give you a crap tasting coffee.